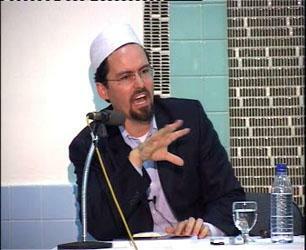 Hamza Yusuf Fails My "Test"
Hamza Yusuf Hanson publicly declares his own extremism. Oct. 11, 2004 update: A note from one "Hamdan Yousuf, Muslim Student Association, Pennsylvania State University," complete with personal website information, informs me in an e-mail today: "I am proud to join a long line of Muslim leaders, including Sheikh Hamza Yusuf, in failing Daniel Pipes' test." And I am proud to list his name here, or that of anyone else who wishes to announce publicly his radicalism on this weblog. Nov. 17, 2004 update: A Muslim academic specialist on Islam informs me that there is a test the other way around. "One of the first questions in determining the modern 'orthodoxy' of a Muslim scholar," he writes, "seems to circulate around Daniel Pipes. ... If a Muslim does not stand against Daniel Pipes, s/he must be a bad Muslim." The question asked is direct and crude: "What do you think of Daniel Pipes and his stance against Muslims?" June 18, 2005 update: "I am an orthodox, practicing Muslim American and I passed Dr. Pipes' test with flying colors." So writes Hamid Ahmed in a comment on my list of questions, followed by his thoughts on Wahhabism and other topics. June 18, 2006 update: Hamza Yusuf may have declared himself an extremist but the New York Times' Laurie Goodstein, in a glowing piece today, deems him someone "encouraging tolerance." Apr. 11, 2007 update: The New York Times may have declared Hamza Yusuf tolerant, but Stephen Schwartz calls him "The 'Sufi' Master of Deceit." lest we forget, the people at Charlie Hebdo knew exactly what they were doing. They acted much like Steve Irwin, the Australian crocodile hunter, who went around poking wild animals only to provoke a response from them. Eventually, he decided that the countless land and river animals were not enough and chose to dive into the vast ocean in search of sea creatures to provoke until a stingray, in apparent solidarity with its fellow land and sea creatures suffering at the hands of humans like Irwin, poked back and killed him. But, like the Charlie Hebdo staff, Irwin well knew the risks he was facing when provoking these wild animals and fell victim to the consequences. The editor of Charlie Hebdo knew the game he was playing and enlisted a guard to protect his staff given the many death threats they had received. He was cognizant of the real dangers of provoking those he deemed open game and sport for the paper's "satire." Comments: Implication (1): Any critic of Islam is asking to be murdered. Implication (2): Islamists have brains no larger than those of crocodiles and stingrays. Jan. 9, 2017 update: Despite his record of unceasing radicalism, Yusuf made moderate statements at the "Reviving the Islamic Spirit" convention in Toronto about Islamism and Jews. Islamist-Watch.org has posted the audio and provided extensive written excerpts. Here are some of them. About ISIS: once you say this has nothing to do with Islam, you just lost all of those people out there that you need to reach. About Islamism: What's been done to Islam is it's been turned into a political ideology by a certain group within the Muslims and so what's happened, by making it a political ideology and saying it can only be practiced within the framework of a political ideology, is a major problem in our community. About antisemitism: we have some of the worst racism in our own community ... the anti-Jewish rhetoric that you hear in the Islamic community is horrific. ... I never say a bad word about Jewish people ever. And yet I have heard in our community so many blatant remarks. Comments: (1) These remarks have dismayed Islamists but give the rest of us hope that Yusuf, an important figure in American Islam, actually is moderating his outlook. (2) Maybe he should try taking my "test" (above) again.